The ATEN CS1944 4-port Dual View Mini DisplayPort KVMP� allows access to 4 computers from a single USB keyboard and mouse with dual displays. The KVM switches amazing functionality combines a Dual view 4-port Mini DisplayPort switch, with a 2-port USB 2.0 hub, and front panel USB quick charge port for mobile devices. 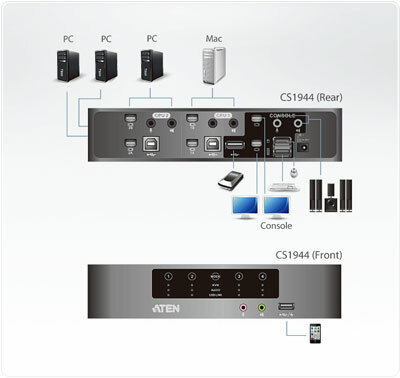 The ATEN CS1944 further improves on previous KVM designs with the latest Mini-DisplayPort and Mini-TOSLINK connectors. These connections provide stunning digital video & digital audio capabilities in a KVM with reliable ultra-high resolutions, vivid picture quality, surround sound (with SPDIF connections), and support for 3D displays. Please Note: The use of video adaptors may cause compatibility issues with the video component of the KVM. The CS1944's independent switching allows the KVM focus to be on one computer while USB peripheral and audio focus are on the other. As a USB hub, it permits each computer to access connected peripherals on a one-computer-at-a-time basis, eliminating the need to purchase a separate hub. All keyboard and mouse data transfers via fast custom KVM cables for seamless response. With its unique design and innovative features, the ATEN CS1944 provides style and superior functionality in any SOHO environment. The CS1944 is ideal for multimedia applications, gaming setups and multi-computer office environments - offering the ultimate space saving, streamlined KVM technology for any desktop. Answer: We do not believe this switch is NIAP certified. However, the following ATEN switch is: https://www.kvm-switches-online.com/cs1184.html. Unfortunately, it is not a dual monitor solution. If you would like assistance in selecting an NIAP certified switch, give us a call at 1-877-586-6654. We would love to help you select the best solution for your particular setup. Answer: Thank you for your inquiry. Unfortunately, due to freight costs, we typically do not ship to Japan. 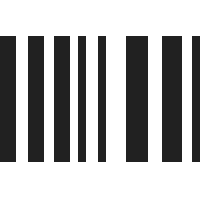 For product availability, we recommend you contact our partner: http://www.ysol.co.jp/. Additionally, we are not sure if this particular DisplayPort KVM is available in your area. You can contact the manufacturer at (http://www.aten.com/about/about_contact.php?cst=cu) to see if this product has a distributor near you. Question: Hello, thinking about purchasing this switch to control a new trashcan mac pro and an older traditional mac pro - both sharing 2 monitors. We use a 4 button trackball - will this switch work? I see some mention of "only 3 button scroll wheel mouse" in emulation mode - please advise. Thank you. Answer: Thank you for your inquiry. We believe the reference to "3 button scroll wheel mouse" is in regards to the ability switch KVM targets via the mouse wheel. One should be able to use hotkeys or the front panel buttons to switch targets as well. That being said, user environments vary widely and we could not 100% guarantee any particular set up would work. However, this KVM has the ability to pass mouse signals directly through, so there is a very good chance it will function as you desire. This switch also has a USB hub, which may also work for the trackball if the console port does not. Question: Does the CS1944 have display emulation? While some DisplayPort to HDMI KVM switches (HDMI output for monitors) like the SmartAVI D2H-4P-Duo have implemented video emulation, as of 06/05/2018 we are not currently aware of a KVM manufacturer that has figured out a way to emulate DisplayPort to DisplayPort KVM Switches since DisplayPort uses a data signal instead of a video signal.